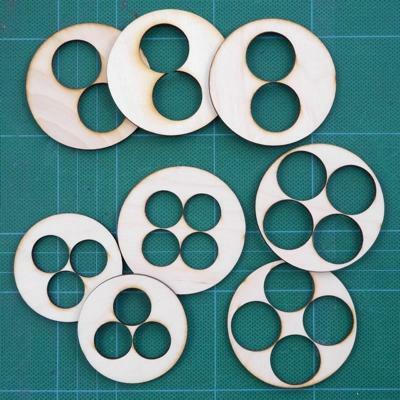 Cluster Centering Rings are lazer-cut plywood rings designed to center multiple engine tubes into a larger diameter body tube. The number after CCR indicates the number of engine tubes (2, 3 or 4). The first number after the dash indicates the size engine tubes that will fit inside the ring, while the second number indicates the size body tube the ring fits inside. For example, the CCR3 - 5070 rings will center three T - 50 tubes into a T - 70 tube. All these rings are made from Birch Ply.